"I'll tell you something, I know what you're thinking." Just like his most famous character, David Tennant has made an unlikely and heroic return from physical setbacks to claim centre stage with wit and verve as he finally reveals to the West End his interpretation of Hamlet that seemed destined to remain forever Stratford's. 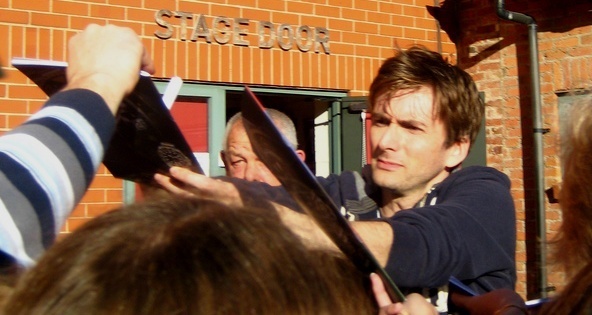 Throughout a first two hours that holds the attention without quite gripping Tennant's portrayal steadily ferments at the centre of a Danish court coalescing around him before the production's second half surges irrevocably into a relentless, crackling intensity that demonstrates why it arrived with the mantle of legend in the making. Those watching for an overt message from director Gregory Doran will be disappointed. In a recent interview he confided that his vision was "not an intellectual one, nor was it directed towards 'being new'". Instead he has let his actors build the play from the inside out and they revel in the freedom to evolve their portrayals unhindered by obedience to a grand statement. The RSC's veterans manage this best. Patrick Stewart makes an intriguingly believable case for Claudius as the kind of modern leader that David Runciman recently categorised a "sincere liar", persuading himself that his thoughts and actions are necessary and right though frustrated by unwelcome facts, while Pennie Downie forges a three-dimensional Gertrude undermined by the tension between duty and a burning cord of motherly love and Oliver Ford-Davies steals the muted first half with a deftly comic turn as Polonius. You can clearly see where both Mariah Gale as Ophelia and Tennant's successful understudy Edward Bennett as Laertes are coming from, but they never quite escape the fourth wall. ...there is nothing either good or bad, but thinking makes it so: to me it is a prison. The framework constructed on the crucial role of imperfect human thought bears the weight of the sudden, multiple deaths at the end as an inevitable collision between Hamlet's foreground instability and the mistaken certainties of those in his orbit. As gravity of various kinds gradually pulls them together Tennant uses some tricks learned in the Tardis, aided and abetted by some dynamic staging, to keep us on Hamlet's side, though we're still puzzled as to why he performs the Danish Prince in his Dr Who accent despite naturally favouring the burr of his native Paisley. It seems odd that both parts should fortuitously require the same regional mode of speech and we would have loved something either more regal or more distinctive, but that quibble only fractionally taints a performance which is otherwise energetic, lucid and, eventually, spell-binding. The pity is that, while we feel privileged to have witnessed it, so few of our fellow Londoners will now get the chance unless some kind of agreement for televisual release can be salvaged at the eleventh hour. Maybe next year? Maybe no go. Picture via Sheep purple's Flickr stream.